Dan Skay, executive chef at Parker Adventist Hospital, in Parker, Colo., loves avocados. He adds that, although the price has risen in recent months, avocados are still a relatively inexpensive food. At Parker, avocados can be found in everything from salads to entrées. The foodservice department even makes an avocado gelato. Sometimes, Skay says, avocado is the star of the show. “We can use it as a showpiece by serving it as a stuffed avocado, filled with a tuna or chicken salad,” he notes, explaining that his chicken of choice is a roasted achiote chicken made in house. Another of Skay’s favorites is a dish in which a fruit salsa is used as a base, followed by avocado slices and topped with a Yucatan chicken salad. Because of the fat content of avocados, when stuffing the fruit with tuna salad, Skay sometimes will use an olive oil and lemon juice dressing in place of mayonnaise. Avocados get an interesting treatment at the University of Connecticut, in Storrs, where Robert Landolphi, manager of culinary development, has helped create Sain, a line of raw foods prepared in the university’s central kitchen. Landolphi says raw foods are ones that have not been cooked in the traditional sense—nothing is heated above 118°F—and ingredients have not been chemically processed, pasteurized, homogenized, genetically modified, hybridized or otherwise compromised. The pudding, which has less than 200 calories, sells for $2.95 in UConn’s retail locations. Avocados can also be found in Sain’s Classic California Sushi Roll With a Twist. In the UConn version, the rice is replaced with puréed cauliflower and there is no surimi—which, because it is heated during processing, can’t be considered a raw food. Carrots, cucumbers, avocado and alfalfa sprouts join the cauliflower in a nori wrap with a bit of fresh wasabi. Sain’s California roll sells for $4.95. Avocados are popular on many college campuses, especially in California, where most avocados are grown. Last year, Stanford University in Palo Alto used avocado as the centerpiece of the menu when it debuted its food truck, the Cardinal Chef Mobile Gourmet, at the third annual Healthy Taste of Stanford food fair. Three avocado recipes were served from the truck during the two-hour event: California Avocado Pita with Grilled Chicken, Quinoa and Yogurt Mint Dressing; California Avocado Spinach Salad with Salmon; and Classic Guacamole. Stanford worked with the California Avocado Commission (CAC) to develop the menu, and the food truck featured customized Fresh Hand Grown in California Avocado merchandising, including production facts and figures. Montell says avocados have always been a student favorite, in everything from guacamole to avocado slices on sandwiches and burgers. The CAC works on a regular basis with non-commercial institutions and contract management firms such as Sodexo and Compass Group on avocado promotions, particularly during National Nutrition Month, in March, and for Cinco de Mayo. • There are three groups of avocados: West Indian, Guatemalan and Mexican. 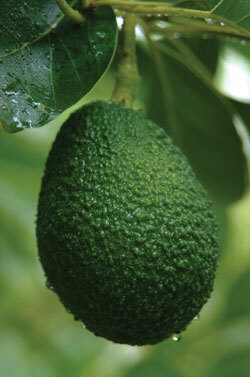 California avocados are primarily Guatemalan and Mexican, while West Indian avocados are grown mostly in Florida. • Avocados originated in south-central Mexico around 6000 B.C. but were not widely cultivated until about 750 B.C. Early Spanish explorers were introduced to avocados—which they called aguacate—by the Aztecs, who considered the fruit to be a sexual stimulant. Spaniards brought the avocado back with them to Europe. • A judge in Santa Barbara, Calif., planted the first avocado trees in the state in 1871. Grown primarily in California and Florida, avocados did not become a commercial crop until the early 1900s and didn’t become popular until the 1950s. But by the mid-2000s, avocados were being used by nearly 50% of American households, according to the USDA. • The name “avocado,” the Anglicized version of aguacate, is attributed to Sir Henry Sloane, the founder of the British Museum, who is said to have coined the word in 1696. • A medium-sized avocado has about 250 calories, mostly from monounsaturated fat. It also has 20 vitamins, minerals and other phytonutrients, including vitamins E and C, folate and fiber.